Hotel Avenida Palace - Lisboa: Lisbon’s newest viewpoint is now open! Lisbon’s newest viewpoint is now open! Do you wish to see one of Europe’s most beautiful cities from a breathtaking perspective? 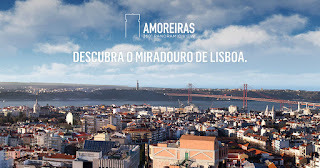 On top of Amoreiras Shopping Center you can find the Amoreiras 360° Panoramic View, which offers an unbelievable view of the Portuguese capital. The new viewpoint offers visitors an amazing panoramic view over the beauty of the Tagus River on one side and the heart of the city on the other. This space claims to be one of Lisbon’s highest spots and it aims to change Lisbon’s tourist map and become one of the main attractions for thousands of tourists who visit the city. This unique 360° view over Lisbon, stretches as far as the eye can see. From here one can observe the city’s hills, the river, the green of Monsanto Forest Park and many of the most emblematic monuments, among other points of interest. The platform, with a capacity for 50 people at a time, is equipped with long-range focus monoculars and informational maps for the historical sites. Access to the Viewpoint is located on the 2nd floor of the Amoreiras Shopping. Tickets cost 5 euros and can be purchased online or at the shopping center’s information desk. At www.amoreiras360view.com you can find out more and plan your visit to this brand new viewpoint! Our pleasure, just glad we could help.